Much as electrotherapy has been a component of physiotherapy practice since the early days, its delivery has changed remarkably and continues to do so. The most popular modalities used these days are in many respects quite dissimilar to those of 60 or more years ago. A simple, but effective clinical decision making model can be utilised. All electrotherapy modalities (with the exception of biofeedback) involve the introduction of some physical energy into a biologic system. This energy brings about one or more physiological changes, which are used for therapeutic benefit. Clinically, it is probably more useful to work the model in reverse - determine first the nature of the problem to be addressed. Then establish the physiological changes that need to take place in order to achieve these effects. Lastly, the modality which is most able to bring about the changes in the tissue(s) concerned should be a relatively straightforward decision. In the clinical environment, there are two additional ‘jobs’ to do : firstly to select the most appropriate ‘dose’ of the therapy and then lastly to apply the treatment. Generally speaking, the delivery of the therapy is relatively straightforward. The dose selection however is critical in that not only are the effects of the treatment modality dependent, but they appear to be dose dependent as well. In other words, it is important to select the most appropriate modality based on the available evidence, but also to deliver it at the most effective known dose. There are many research publications that have identified a lack of effect of intervention X, yet other researchers have shown it to work. This appears strange at face value, but when dose and treatment parameters are taken into consideration, it becomes clear that there is a dose dependency, and the evidence for this is getting stronger the more that gets published. The electrical activity of the body has been used for a long time for both diagnostic and monitoring purposes in medicine, largely in connection with the ‘excitable’ tissues. Examples include ECG, EMG, EEG. More recent developments have begun to look at the tissues which were not regarded as excitable, but in which, endogenous electrical activity has been demonstrated. The endogenous electrical activity of the body arises from a variety of sources, some of which are well documented whilst others remain more obscure in their origins & control mechanisms. The relationship between endogenous electrical activity (not exclusively potentials), injury & healing have been researched in several areas of clinical practice and has been well documented in several publications, including Watson (2002, 2008). The subject of endogenous bioelectricity is somewhat larger than can be detailed here, though there is one important link between regular electrotherapy and endogenous bioelectrics identified below. Every living cell has a membrane potential (of about -70mV), with the inside of the cell being negative relative to its external surface. The cell membrane potential is strongly linked to the cell membrane transport mechanisms in that much of the material that passes across the membrane is ionic (charged particles), thus if the movement of charged particles changes, then it will influence the membrane potential. Conversely, if the membrane potential changes, it will influence the movement of ions. Relative to the size of the cell, the membrane potential is massive. The membrane is, on average 7-10 nm thick (a nanometre is a thousandth of a millionth of a metre). The equivalent voltage is somewhere in the order of 10 million volts per metre (which is reasonably impressive!). The energy in the membrane (and other organelles of course) offers the potential (no pun intended) to change the behaviour of the cell – one of the fundamental tenets of electrotherapy – and therefore make a difference to the behaviour of cells and tissues. That different cells and tissues respond preferentially to different types of energy and at different ‘doses’ should be no surprise. 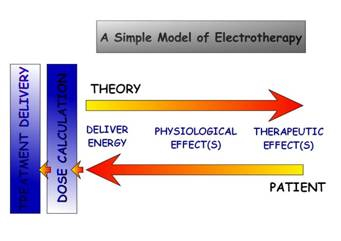 Given the natural energy systems of the living cell, there are two approaches to the application of electrotherapy modalities. Firstly, one can deliver sufficient energy to overcome the energy of the membrane and thereby force it to change behaviour. Secondly, one can deliver much smaller energy levels, and instead of forcing the membrane to change behaviour, it can be ‘tickled’. Low energy membrane tickling produces membrane excitement, and membrane excitement in turn produces cellular excitement. Excited cells do the same job as bored cells, but they do so at a rather harder and faster rate. It is the excited cells which do the work rather than the modality itself. In addition to considering the endogenous potentials, there are several exciting aspects of this work which are of more direct relevance to physiotherapists and others working in the rehabilitation filed. Most obviously is the possible relationship between the endogenous bioelectric activity and the energy inputs (in a variety of forms) by means of electrotherapy treatments. There has been a general trend over the last few years, for the energy levels applied in electrotherapy to be reduced. Ultrasound treatment doses are significantly lower (in terms of US intensity & pulse ratios) than previously thought to be effective. Pulsed Shortwave employs power levels which are several orders of magnitude lower than those applied during continuous shortwave therapy. Laser therapy is another such example of the clinical application of low energy levels to damaged, irritated or traumatised tissues. The over-riding principle of these interventions, is that the application of a low power/energy modality can enhance the natural ability of the body to stimulate, direct and control the healing & reparative processes. Instead of 'hitting the cells' with high energy levels, and thereby forcing them to respond, the low energy applications are aiming to tickle the cells, to stimulate them into some higher activity level and thus use the natural resources of the body to do the work. This philosophy can be applied to many areas of therapy, not exclusively to electrotherapy - though it does marry well with the subject. Several areas are currently being investigated in this respect, including the possibility of using the endogenous bioelectric activity as a feedback mechanism to enable the patient to take (natural) control of their healing, measurement of the physiological effects of a variety of electrotherapy modalities (including Pulsed Shortwave, Interferential Therapy). One final area of interest is to potentially take the applied energy to really low levels (microcurrent type therapies) and deliver a current to the tissues that is remarkably similar to the endogenous currents that appear to be physiologically effective. Several machines are already available that work on this basis, and the research is picking up rapidly in this field. Electrotherapy has a place within clinical practice. When used appropriately, the evidence supports its effectiveness. When used in other ways, it is not surprising that it has little or no beneficial effect. Modality and dose selection appear to be key, and critical clinical decision making issues.